Take Inspiration From This Style Diva & Be The Ultimate Wedding Guest This Season! Fashion is forever evolving and people are constantly experimenting with what they want to wear, especially during the shaadi season. Girls, let's be honest, we all dress up for ourselves but it doesn't hurt when we get a few compliments or two on our glam outfits. Single girls know what I'm talking about when I say that you want to me 'that' dulhan ki dost who all the groom's cousins are admiring. Dancing and flirting with the boys' side is a must on your bestie's wedding, amirite?! 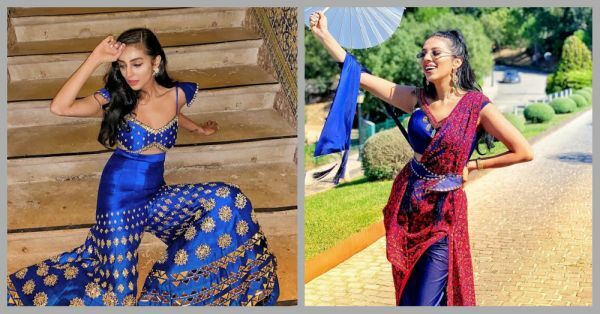 And sarees, anarkalis and lehengas are so passé, so just for you, we've found a girl who is giving us some major wedding guest inspo with her quirky and fun ensembles. 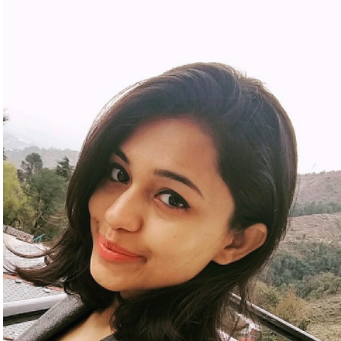 Meet, Payal Shah Parikh, a luxury and fashion entrepreneur who isn't afraid to try something out of the box. These unconventional drapes by designer Aditi Gupta is perfect for a sangeet or mehendi function. We love how Payal has teamed up this stunning off-shoulder electric blue slit gown with a tasselled, hand-crafted belt and intricate Kashmiri drape, ideal for a day wedding. Finish your look with some nice boho earrings and tie your hair up, wear those metal frame sunglasses and be a head turner. Sparkle in this gorgeous blue, flared jumpsuit by Papa Don't Preach at the next cocktail party or sundowner you got to attend. Also, how pretty is the cut out blouse design, high time you ditch the cliche lehenga looks and go in for this new age jumpsuits. We dig! Sarees are always a great option for a wedding occasion when you don't feel like slipping into those heavy lehengas. This tiered ruffle and pastel striped sari by Arpita Mehta is perfect for those easy breezy vibes at a summer wedding. Flip your hair, keep your makeup minimal and you are sure to look nothing less of a Yash Raj heroine. We bet! They say that nothing flatters a woman more than the colour red and looking at Payal, we couldn't agree more. Dressed in a blood red ready-to-wear saree by Cherie D by Sherina Dalamal, she looked breathtaking. A neat bun, striking red lips and minimal statement jewellery, it's just how you do it! "I absolutely love the way Indians are creating clothes nowadays. There's so much more than just the basic shapes and colours. Which is why when I attend weddings which I know will have interesting scenics and colours, I try to match that city’s vibe to which designer I choose to work with. Out of my four looks, I went for three sarees - all were absolutely unique for the event I wore them to - the two things they had in common were they were all ready to wear sarees for me to put on in less than 3 minutes and how light they were to carry considering it's a destination - but when worn and styled properly they have really great effects due to layering, ruffles and colours. My first saree literally matched the buildings of the city, my second saree was a new take on how you wear the yards with belting up and keeping a trial but all in Kashmiri thread work! And my third was what I call a Spanish tango, just loved the elegance on the red! The jumpsuit was just an electric power of blue which I think you can always get away with when wearing to an occasion like sangeet. The fact that it was a jumpsuit - it took just minutes to have on again. I chose my hairstyles and makeup according to how much drama the outfit carried too - I play a lot more with lip colours than eye makeup and keep then face on the dewy end when it comes to finishing. Also, everything just looks more beautiful when under the European skies!"